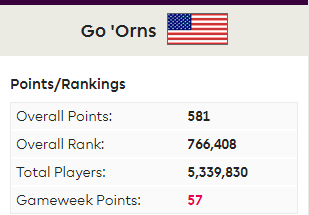 Hi my dear friend, I am very glad you had a good week, and it is nice for you that you choose Richarlison for captain – He should have taken the penalty and bringging you 30 points! Salah is just phenomenal and I think he will first at points from all mids in the end of the season. I think Walker will bring you more points and he is essential.. Alonso is dissapointing for me with his tag price..
About Eriksen I moved him 2 weeks ago to Salah and very happy with it, I don’t like his form and when Trip is playing , he even don’t have free kicks and cornerx, I would consider replace him.. I think now when Mane is back Liverpool will explode and score alot of goals, maybee would consider double up..
As for me I had luck with another green arrow (10/11) my OR went up by 50k to 142k. 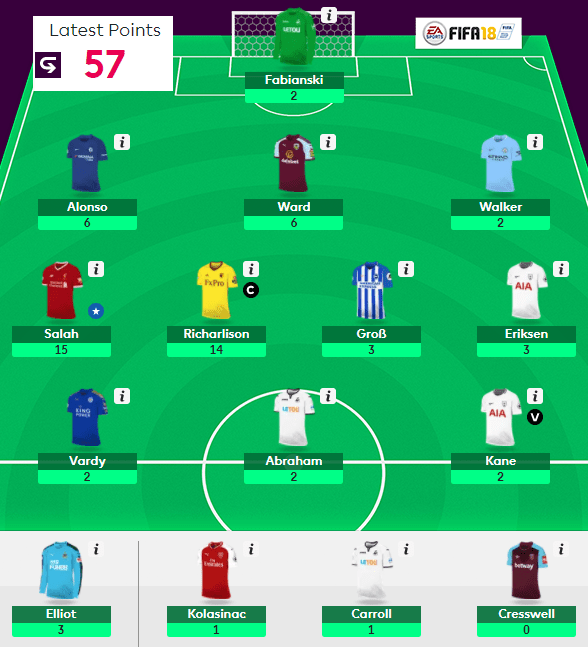 I scored 54 points with returns of : Mee 8 Moting 5 Richarlison 7 Salah 15 and Rahim 5, again failed in captain choice with Hary..
As for next gw I did an early transfer bringing Moreno instead of dissapointing Cedric. Iam thinking of Salah as a captain , and not shore if need to play Tripp or Vardi. Would like to here your thougths..
Richarlison was a good call…finally! 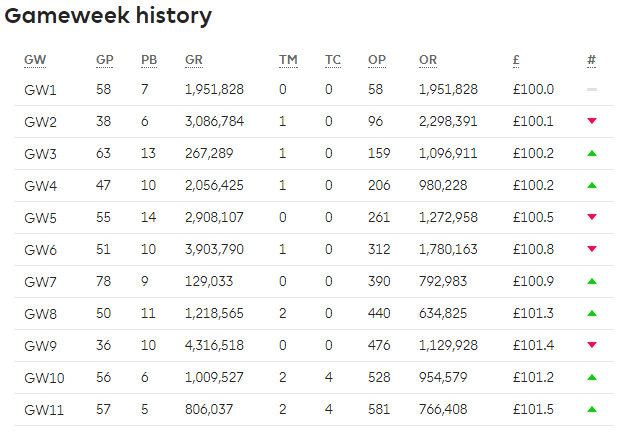 Kane went on to disappoint, but I am keeping faith in him, as the forward to own, more than Aguero or Lukaku. Salah had a great a performance with 2 goals and I agree with you could be the top midfielder this season. I do like the idea of doubling up with Mane going forward, he looked great in his first game back. Defensively, Alonso is going to be moved out of the international break for Charlie Daniels or Phil Jones. Whoever I don’t bring in for GW12 will come in GW13 for Kolasinac. Not sure Arsenal are going to keep CS.